As skis get fatter and fatter and are beginning to be used everywhere both off-piste and on, could this fat ski trend contribute to the plethora of potential knee injuries we see as skiers? There has been some occasional discussion regarding fat skis or powder skis and the potential for knee injury and to date there’s no real research been done examining if they do cause any problems. 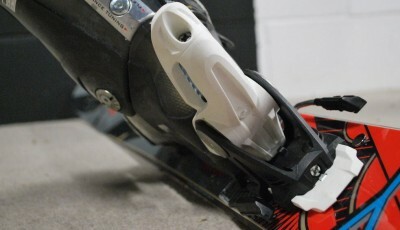 Some suggest thatas a fatter ski sinks less in the powder, then landing from jumps can exert a greater force on the legs and body than if you were to sink into the powder up to your neck, and there’s also been mention of the increased weight and swing-weight of the ski with regards to torsional forces on the knee. However, as ‘all mountain’ skis get fatter and are now getting to the 100mm underfoot or wider we are seeing more and more ‘fat’ skis being used on the piste, I find myself wondering about the lateral forces on the knee joint. This is the force exerted on your knee to keep a ski on it’s edge when on the piste. It doesn’t apply when skiing in powder or snow soft enough to allow the ski to turn on a platform of snow under it’s base, only when the ski is set on it’s edge on hard-pack. The natural tendency for your ski is to lie flat on the snow. When edging you are leaning the ski onto it’s side and, amongst many other forces actions and movements, are resisting it’s tendency to lie flat on the snow again otherwise you just slide sideways. With narrower skis which are around the same width as your foot or narrower, the lateral force is pretty low and almost all the force is up and down your leg, pressing the ski edge into the snow. As the ski starts to get fatter than your foot, you’re not just setting the ski on edge but also levering yourself up off the snow. This has a double effect : 1 you’re adding the force required to lift you off the snow to to the forces involved and 2: the wider ski is adding a longer lever to the lateral forces applied to your knee. I pulled together a very basic 2D model in Working Model 2D which allowed me to play with forces and angles. I used rough measurements of my own leg and body to get an idea of lengths, weights and forces. and then simplified the model such that the interface between the ‘ski edge’ was a simple pivot, the ski and lower leg element were a solid structure, and the knee joint between the lower and upper leg elements was another simple pivot. I then set the model at 30 degrees to the horizontal and applied a force directly down through the leg, somewhat similar to carving a turn on a wide flat piste. As expected, without any lateral force supporting the knee joint, the system collapsed. That’s to be expected, however, we need knee stability even just to stand still, but it at least collapsed in the way I expected with the knee moving outwards as the ski flattened on the snow. I then played about with lateral forces on the knee joint until I could keep it reasonably stable. The model started in a state of unstable equilibrium so it would be impossible to get it to stay perfectly stable once the forces were applied but again, it was all moving in the directions I anticipated. The next step was to rebuild the model using a narrow ski. For this, I halved the width of the ‘ski’ and again used a simple pivot at the contact point with the ‘snow’. Again, I played around with various forces on the knee and what it appears is that as the ski doubles in width, so does the lateral forces on the knee. Now I recognise that this is a VERY simple model and the methods are more than just a little flawed so I am not going to suggest the figures themselves are anywhere near accurate but it does support my original hypothesis, that fat skis, when used on piste, significantly increase the lateral forces on the knee. I would go so far as to suggest that we have not seen any significant incidence of knee injuries from this for a number of reasons. Those who ski fat skis on the piste are still relatively few compared to the number of piste skiers. Those who do would likely be younger and fitter so perhaps more able to cope with these forces in the short term. Fat ‘all mountain’ skis of the dimensions I’m considering are still relatively new, and there’s probably just not enough people out there using them yet for any real picture to be painted of whether this is an issue. As knee injuries are prevalent in skiing anyway, the width of the ski may be overlooked in diagnosing the cause of the injury in favour of more common causes. After some further discussion, I’ve done some more modelling and have some rough figures for the forces in question. Proportional increase base on ski width of 1.375 (i.e. 110/80) matches the proportional increase in observed force on the knee. I do not profess to be an expert in biomechanics nor am I a fully qualified engineer, but I do consider myself to have a strong technical background and a solid if basic understanding of both disciplines. I’m more than open to correction or explanation of where my understandings are flawed but if I’m right, then it explains my own experiences of knee discomfort after skiing fat skis on the piste (115mm under foot). It has been encouraging to come across posts from elsewhere such as this from RealSkiers.com which asks, do we need fat knees to ski on fat skis? As I said, I am no expert but believe that my reasoning is sound, if a little basic and I would be keen to see some more research and discussion on this aspect of the effects of fat skis on the knee. Thanks for the comment Dave, it’s nice to know I’m on the right track. In fact, I surprisingly blew my left MCL a week ago at low speed transitioning from a small patch of hardpack/ice to groomed snow pack. My left leg was the downhill ski, and instead of feeling the traditional edge, the energy transfer caused two audible pops in my knee followed by my binding releasing and sending me airborne. The cause of the incident has been a mystery to me until tonight. The physics just make sense. Once I finish rehab, I will be sure to save my fatties for the soft stuff. I turn 50 this year and want to figure out how to go another 25 years downhilling. On hard snow: the wider the ski, the greater the leverage on the edge of the ski, due to the position of the boot/ankle away from the edge…hence more knee angulation to hold the ski on edge. On ice, the narrower the ski underfoot the easier on the technique and the knee… (For some help with ski specific injury prevention and conditioning for longevity see `Fitness and Motor Control for Skiers Their Knees and Backs`). Does it actually need to be angled more to maintain the same edge grip? Or is it not that the angulation is the same but the forces required to maintain that angulation are increased? Perhaps to compensate for that increased force, further angulation is used so the forces required to maintain that degree of angulation is lower i.e. you’re edging more aggressively than is normally needed for that turn radius. 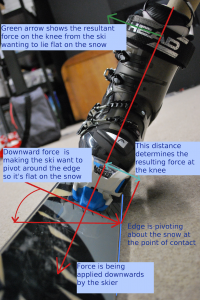 Suggest its partly semantics, partly how you personally adjust to solve the problem …There is the problem of aligning the ankle as well as the CofG on the edge you are standing `balancing` on for your platform angle – you have to do more somewhere…I suggest more force and more angles – consider balancing on the edge of a step in one ski boot – then image balancing on the edge of a piece of wood fixed to the boot that is much wider than the boot – what adjustments must you make? I agree, I think it’s semantics. We are, indeed, saying the same thing, just approaching it from a different angle. I recently tried a pair of Rossi Soul-7 (114mm underfoot) on a “hard and fast” day. I liked them a lot and if I had to have only one pair of skis, these would be IT. I did experience the lateral forces talked about above noting that when I felt them, I was really holding an edge. Being a human and being able to feel forces, I know I can reduce the force any time I like and played around with this notion while on the skis. The force I felt was akin to wearing too-soft ski boots. The forces were trying to bend my ankle sideways, not my knee (one knee has no ACL). I think in a correctly balanced turn, not a static model, the forces will be more like I described. Note that most (current) knee injuries are due to the “phantom foot” phenomenon which is foreward displacement of the tiba relative to the femur, not a sideways over-stretch. Doesn’t mean the sideways stretch won’t happen, just that it isn’t happening much at the moment. I do appreciate you taking a mechanical approach to a potential problem. It was a similar mechanical approach, here in Vermont, years ago that developed the releasable binding to the very good reliability that it has today. Who am I? 71 years old, 40+ day per year semi-pro skier, 60 odd years experience, peripheral to the ski industry for many years starting before releasable binding were very good. When I first bought my fatter “Big Mountain” skis, I thought I had found a true one ski quiver. But after spending some time on them, I have experienced soreness in my knees after skiing on hard pack or groomed snow. I have been a Masters and club racer for over 30 years. So I tend to carve more turns than the average skier. I added a pair of more traditional all-mountain skis for hard-snow days and my knees are happy again. This analysis backs up what I was feeling.